Lighting-Gallery-net - Fluorescent - T-12 and larger/GE F40SPX35 lit! High hours, but still works. Odd seeing SPX on the old style etch. 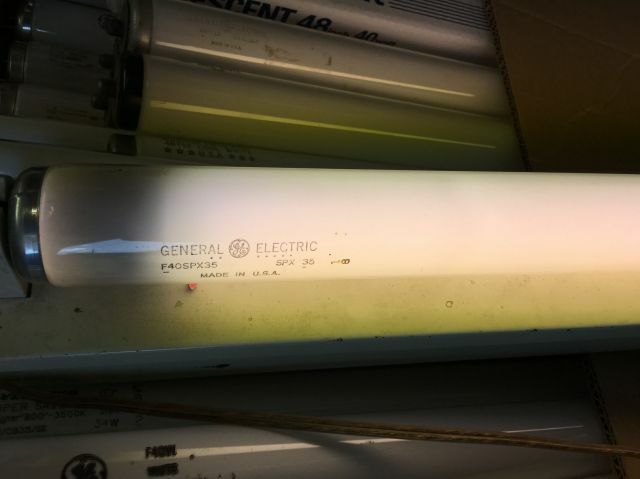 GE started making the Rite-White/Regal-White 3000K lamps in 1979, later became the SPX. So yeah, old etches are expected. Either high hours or frequent starting/cold cathode starting; though some batches of tri-phosphor seem to have early blackening problems too. SWEET! I have a bunch of these in 3000K. Nice lamps! Great find! As far as abuse, I'm trying to "clean up" an abused Vita-Lite PowerTwist on a slimline ballast to hopefully make it work on RS again. Good to hear, I should try to light this for several hours and see. I got about three identical lamps. I always liked these lamps. It is these SPX lamps that should have been made for home use, not a relabled WWX.